Second Stretch: Julian to Rocky Camp. The Desert. Second Stretch: Julian to Rocky Camp. Day 5: Julian to Windy Bivy. 12 miles. Our Airbnb we stayed at near Julian was interesting. Rodents sprinting around in the ceiling kept me from sleeping well. Even inside a house my nerves were still on edge from my last night on the trail. The gigantic bed was at least three times the size of our little bed at home, but it was so worn and soft that both Melanie and I sank into the pit in the middle together. As I laid there, my mind was already back on the trail. One main thought raced through my head over and over again: please let me find someone to camp with tomorrow. After some computer work and breakfast, I said goodbye to Mel. The first section was only a few days, it was easier to part ways knowing it would be soon when we'd see each other. It didn't feel real. The next time I would see Mel would be in the little town of Acton, California, almost 400 miles away. That's almost three weeks of hiking. Now it felt real. Mel's teary goodbye had a lump resting in my throat as I walked back out into the open, dry desert. She had surprised me with a nice artisanal salami from a farmers market in San Diego. Gold for a hungry backpacker. The next section was a long uphill climb without water for about 20 miles. I had five liters of water on me and six days of food. It was too much. My ultralight pack wasn't sitting as comfortably as it normally did, but I didn't have the guts to dump out a liter of water while looking up at the vast expanse of desert mountains in front of me that I was about to cross. I passed the water cache under the 78 overpass, it was well stocked. There were two thru hikers waiting out the heat of the day next to the water cache. Potential camping partners?? They didn't speak English, which makes discussing camping plans tough. As I hiked up along the foothills in Anza Borrego State Park, the winds picked up. The weather called for 25 mph winds, which is stiff, but manageable. The winds would ramp up to 90 mph gusts across the mountain ridges, but I didn't know that yet. I hiked through beautiful fields of wildflowers. Sometimes I chased my hat through beautiful fields of wildflowers. Was this really just 25 mph winds? I didn't see any other hikers for the next 11 miles. The winds ramped up harder and harder. Every time the trail wound out to the exposed ridge, I struggled to stay on my feet. The gusts were wild and unpredictable, one bad gust and I'd be tumbling down the cactus-choked slope. Winds were definitely higher than 60 mph. How much higher were they going to get? It was getting dark... there's no way I can pitch my tent in this.... am I in trouble? As I worked my way higher and higher up on the ridgeline of the mountains, the winds kept getting worse and the campsites kept getting more and more exposed. No other hikers meant I'd be camping alone again. Perfect. I came across a slanty, small tent site inches off the trail in a small cove. The winds were slightly tempered, so I decided to stop there for the night. The windy bivy site just off the trail. I struggled setting up the tent as powerful gusts would pump through the cove. The ground was soft and my tent stakes weren't staying put. Perfect. As darkness was setting in, I gathered the biggest rocks I could find to anchor the tent. Feeling exhausted and lonely, I couldn't boil water in the crazy winds, so I grabbed the salami Mel had gave me. I opened it up, excited to try it out and let her know how I liked it. It was covered in mold. I called it quits for the day and crawled into bed. As soon as I was comfortable in my sleeping bag, a massive gust surged into the cove and snapped one of my tent's guylines. I sat inside staring up at the partially collapsed tent. The psych for being out on the trail was draining. Fast. Ever restring a tent line half naked in the cold, dark wind? Ladies and gentlemen: the result. Ready to be done with that day, I scurried around in the black night in my underwear, gathering even BIGGER rocks to fortify my tent. Through an impressive string of expletives, I restrung the verbally abused tent guyline that had snapped. I crawled into my tent and just thanked the trail gods that at LEAST it wasn't raining. The rain started soon after, bringing sideways rain up under my tent's sidewalls. Looks like the percent chance of rain wasn't QUITE zero percent. Vowing revenge against every weatherman who ever lived, I did my best to block the rain spray with my pack and attempted to sleep through the chaos. 'You're not doing this because it's easy', I repeated to myself. 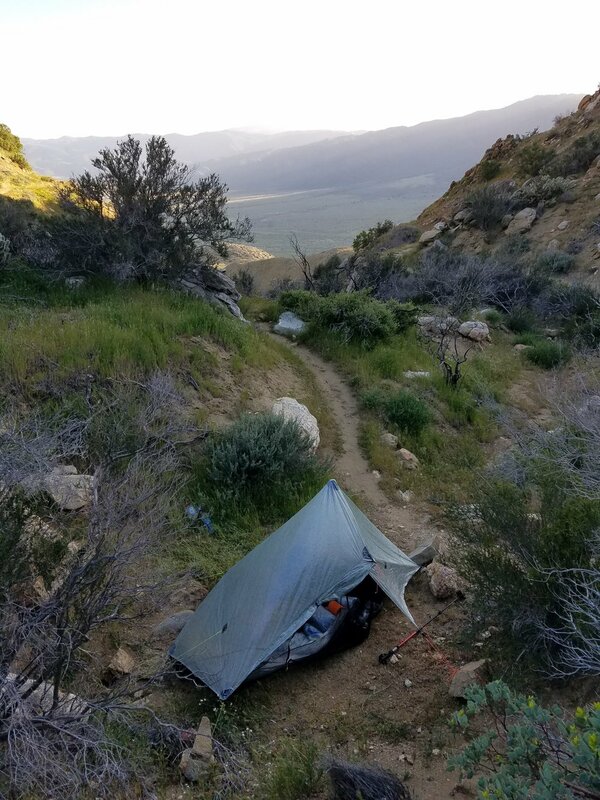 Day 6: Windy Bivy to Warner Springs. 21 miles. I woke to a more peaceful morning and a soggy sleeping bag. The previous night's powerful sideways gusts had brought some rain up and under the tent's sidewalls. Sleep was interrupted all night, so I felt exhausted as I rolled out of the tent. I packed up everything still wet, I didn't have the time to dry my gear out before hitting the trail. As I finished packing, two hikers walked by my camp, Alice and Bard. Just seeing other people can be a huge relief sometimes. 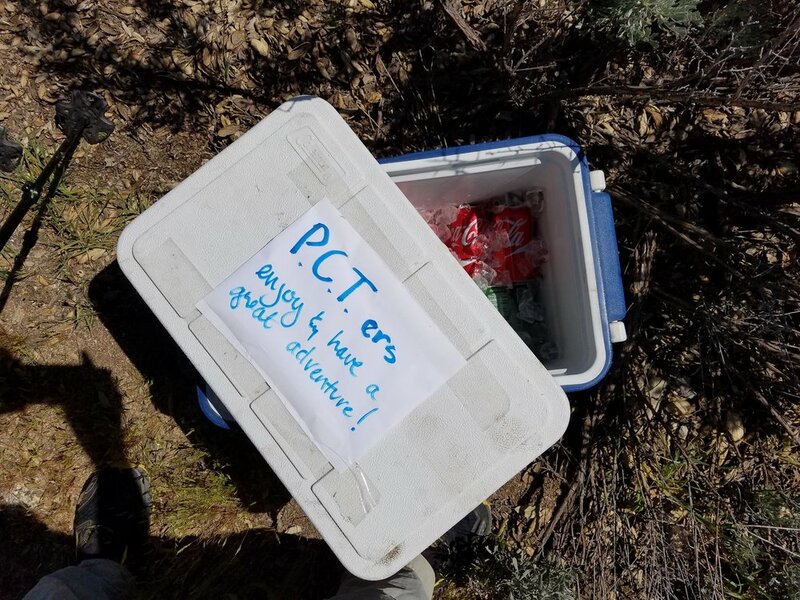 For such a popular trail, the PCT sure can feel isolated. Morning walk out of my windy bivy. As I set off for the day, the beautiful morning and views reminded me why I was out there. I was glad I hadn't set fire to my belongings last night like I wanted to. Good call. It was still windy, but only keep-the-nips-hard windy, not blow-you-to-your-pokey-death windy. I carried way too much water with me from Scissors Crossing. The concept of hiking into a desert with questionable water sources was still a foreign concept to my Sierra hiking brain. I ended up with three liters extra at the next water source. Six extra pounds of water is no bueno (this is the extent of my knowledge of the Spanish language) when your base weight is only 13 pounds. Barrel Springs. Strolled up to this beautiful water source with three liters of water still. Have you ever had one of those days where you stub the same toe over and over again? And it makes you want to attack innanimate objects? This day was one of those days, only I kept rolling my right ankle. Over and over and &$%#ing over again. If I didn't know I needed my shoes for future activities, they would've been flying down the hillside to their pokey death. I ankle-rolled my way past the 100 mile mark, smiling through the tears of frustration. 'You only have to do this 26 more times...', I thought to myself. Yippee. Shortly after, I came across a cooler full of Cokes next to a busy road. 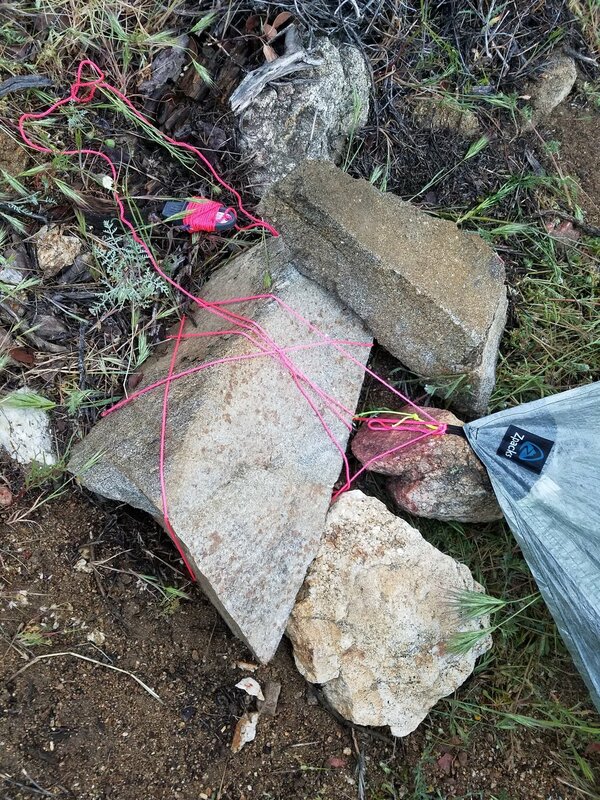 My first trail magic! I chugged a can down and limped ahead, reinvigorated for the next half-mile until I remembered why I normally don't chug Cokes before physical activity. The stomach ache and tanking blood sugar helped take my mind off of my ankle woes, so that was nice. I powered through the sugar crash into a series of beautiful, rolling meadows full of wildflowers. Eagle Rock appeared and much to my surprise, it looked like an eagle! The aptly named, Eagle Rock. I hiked along a small stream for several miles. Poison Oak was everywhere. I walked along dead center of the trail, keeping all body parts tucked in to avoid the green monster. Having a strong background in avoiding the walls in truck stop bathrooms, I waltzed safely into Warner Springs. Warner Springs Community Center was a very cool spot. They had charging outlets, bucket showers, coffee, restrooms, hiker buckets, and a great camping area. They even had an Airstream trailer in the parking lot that had been outfitted as a mobile ultralight gear shop! I met a new group of hikers: Bearbait, Nico, and Jellybean. I also caught up with Aika! I started with her at the border and we seem to be on the same mileage schedule. She's a bit older than me and doesn't hike quite as fast, but she's a machine. She'll hike continuously for ten hours without slowing down. I'll hack out ten miles really quick, but then I'll find a distracting bag of gummy bears or something in my bag, sit down on a rock, and then spend hours organizing/naming/eating my snacks and before I know it, Aika's ahead again! It's very much a tortoise and the hare situation. Day 7:Warner Springs to Rocky Camp. 14.5 miles. The day started slow. I was torn between a rest day and a hiking day, and my indecisiveness led to just making coffee and breakfast in my tent. A nice, slow morning was perfect for recharging mental batteries. Aika's girlfriend, Liz, came to visit us. She brought fruit for all the hikers, a delicacy for humans who can only eat food that will stay good for weeks in a backpack. Liz and Aika were headed to Julian for the day to eat some pie and see the town. Aika had planned on returning from Julian and doing a little bit of milage to get out of Warner Springs. I was relaxing in the community center when Aika arrived back from Julian early with pie and sourdough bread and a new plan: Let's hike FOURTEEN miles instead of five! I've started to call Aika 'Convict', because every day she's ready to hike before me and she bolts out of camp, like a convict on the run. Then I pack up and start hiking, racing to catch Convict before any important gummy bear distractions come up. Trail names are an odd thing. It's still weird to introduce yourself as a different identity. I figure further down the trail it will become more comfortable. It's definitely fun coming up with suggestions for hikers you get to know. There was Poison Oak everywhere along the trail again. It loves wet areas, and we were hiking in and out of a riverbed for a large portion. At one point, I snagged my left pant leg with my right shoe... and ripped a giant hole in my left pant leg. I stumbled and recovered inches from faceplanting into a large Poison Oak bush. That would've been itchy. The day ended with a great little campsite among boulders. There was a perfect fire pit and even a bunch of wood that had been gathered, just for us (I'm assuming). We were roasting sourdough and having some great conversation. To put out the fire, I peed on it. Then the winds decided to shift so the lovely roasted pee aroma drifted right over to our camp as we prayed it wouldn't cling to our gear. It can't all be roses, people.